Healthful eating is a good investment that improves lives, reduces health care spending, and saves money for employers, health insurers, and individuals. To encourage healthful eating, several programs involving supermarkets have been developed to help consumers and businesses better access and sell fresh fruits and vegetables and take advantage of food as medicine. A Newton, Massachusetts-based company, NutriSavings connects with employers, health insurers, and grocery stores to offer nutrition-focused wellness solutions. It's partnered with more than 75 supermarket chains that have more than 12,000 individual stores, including Walmart and Kroger, to reward participants with cash incentives for healthful grocery purchases.2 Employers, health insurance companies, and retailers can sign up to offer the program to their employees, subscribers, or shoppers (participants). Once a participant opts into the program by registering their grocery loyalty card on the NutriSavings website or mobile app, purchases can be tracked for nutritional quality with the use of a scoring system between 0 and 100, with 0 being the least nutritious and 100 being the most nutritious. After each supermarket visit, the grocery store uploads participants' data. Participants get an e-mail with a score for each shopping trip and can receive cash back for healthful purchases. For example, in "Cash for Your Cart," a program developed by NutriSavings in partnership with MaineHealth, participants can earn $10 in "Healthy Paybacks" with an average cart score of 60. In a six-month period, participants are eligible to earn up to $50 that's directly added to their paycheck. Multiple supermarkets can simultaneously participate in the program and can drive customers to their stores by offering unique savings opportunities and e-coupons specific to their stores. Hannaford, a large retailer in New England that was part of the MaineHealth program, chose a collection of store-brand products that would offer significant savings to shoppers in an effort to drive customer traffic to its stores and build loyalty among program participants. Results indicate that the program can impact healthful shopping behavior and specifically influence the purchase of fruits and vegetables. In a case example with the Jackson Laboratory, an independent nonprofit biomedical research institution, NutriSavings was introduced to its employees in 2014 to offer a measurable solution that would encourage them to eat healthfully to reduce chronic illness. A powerful incentive included $120 off the annual health insurance deductible simply for signing up for the program. In 2016, the Geisinger Health System launched the Fresh Food Farmacy, a program that offers food-insecure patients with diabetes in Shamokin, Pennsylvania, "prescriptions" for free food with the aim to optimize the treatment and management of the disease.6 The program reinforces the "food is medicine" concept by removing barriers such as high cost and inability to access healthful food, while also optimizing family involvement and hands-on education. With the support of the Degenstein Foundation and community partners, including the Pennsylvania Food Bank and Weis Markets, patients are given enough food—including vegetables, fruit, lean protein, low-fat dairy, and whole grains—to prepare five days of healthful meals twice per day for their entire family. Not only is the Fresh Food Farmacy saving on health care costs but participants also are empowered to manage their medical condition through healthful eating and lifestyle changes that involve their families. Food also is touted as medicine in Fruit and Vegetable Prescription (FVRx) programs, in which doctors "prescribe" fresh fruits and vegetables to send the important message that healthful eating is key to healthful living. FVRx programs are gaining in popularity as essential components of behavior change programs geared toward helping low-income individuals prevent diet-related health conditions. Michel Nischan, a chef and founder and CEO of Wholesome Wave, introduced the concept after making the connection that low-income patients need help paying for healthful foods in addition to learning about how and why to eat them. Recognizing that 10% of children eat the recommended servings of fruits and vegetables per day and that the United States spends more than $1 trillion per year on diet-related illnesses, Wholesome Wave uses grant and foundation funding to create partnerships in high-risk areas across the country to improve affordability and access to fruits and vegetables. Founded in 2007, Wholesome Wave set out to help maintain farmers' markets in underserved, low-income communities. By empowering participants in FVRx programs to use their "prescriptions" to buy food from local farmers at farmers' markets, entire communities can now work together to overcome obstacles to affording and accessing fresh fruits and vegetables. Wholesome Wave's prescription program has increased the consumption of fruits and vegetables dramatically and shown a 47% decrease in BMI among participants. The success and impact of its programs have garnered national attention. To learn more about how to introduce a FVRx program in your area, Wholesome Wave offers "The Fruit and Vegetable Prescription Program Toolkit" at https://bit.ly/2Jw3AgF. 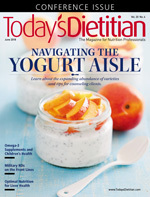 Through innovative programs such as NutriSavings, the Fresh Food Farmacy, and FVRx programs that emphasize healthful food as a vital component to preventing and treating chronic disease and maintaining optimal health, the role of dietitians in reducing health care costs will be more valued than ever. — Barbara Ruhs, MS, RDN, is a retail health expert to supermarkets and food companies and founder of the Oldways Supermarket Dietitian Symposium. Follow her @BarbRuhsRD. 1. Chronic disease overview: chronic diseases: the leading causes of death and disability in the United States. Centers for Disease Control and Prevention website. https://www.cdc.gov/chronicdisease/overview/index.htm. Updated June 28, 2017. 2. NutriSavings. NutriSavings website. http://www.nutrisavings.com. Accessed April 5, 2018. 3. Segal L, Opie RS. A nutrition strategy to reduce the burden of diet related disease: access to dietician services must complement population health approaches. Front Pharmacol. 2015;6:160. 4. Moran AE, Odden MC, Thanataveerat A, et al. Cost-effectiveness of hypertension therapy according to 2014 guidelines. N Engl J Med. 2015;372(5):447-455. 5. Niebylski ML, Redburn KA, Duhaney T, Campbell NR. Healthy food subsidies and unhealthy food taxation: a systematic review of the evidence. Nutrition. 2015;31(6):787-795. 6. Fresh Food Farmacy. Fresh Food Farmacy website. https://www.geisinger.org/freshfoodfarmacy. Accessed April 11, 2018. 7. Lagasse J. Geisinger's touts food-centric diabetes program The Fresh Food Pharmacy. Healthcare Finance website. http://www.healthcarefinancenews.com/news/geisingers-food-centric-diabetes-program-fresh-food-pharmacy-improves-patient-health-bottom. Updated May 8, 2017. Accessed April 5, 2018. 8. American Diabetes Association. Economic costs of diabetes in the U.S. in 2017. Diabetes Care. 2018;41(5):917-928. 9. The Fruit and Vegetable Prescription Program Toolkit. Wholesome Wave website. https://www.wholesomewave.org/sites/default/files/network/resources/files/The-Fruit-and-Vegetable-Prescription-Program-Toolkit.pdf. Published 2016. 10. Chronic conditions in America: price and prevalence. RAND Corporation website. https://www.rand.org/blog/rand-review/2017/07/chronic-conditions-in-america-price-and-prevalence.html. Published July 12, 2017.